Inca civilization constructed a major Inca trail net which goes through Andes mountain chain and gathered many South America countries like Ecuador, Perú, Chile, Bolivia and Argentina. It is estimated that distances between these roads from side to side have kilometer 12,000 rs approximately, among them there are cobblestone roads, tunnels, rustic bridges, walls and refuges which had been used as checkpoints and shelters. The Inca trail is considered among the best 10 top trekking routes worldwide, with 43 kilometers of distance and located in Perú, Cusco region. Our visitors accomplish the hike during 4 days until reach Machupicchu inca citadel. This trail starts on Sacred Valley of the Incas, in the Piscacucho community which is located 2 hours away from Cusco city.From here, our visitors will start the hike and visit some archaeological sites as Patallaqta and other local communities, during this hike we will ascend more than 2000 inca steps towards the highest point nowadays known as Death woman’s pass which is located 4200 m.a.s.l., from here the descend to tropical forests will iniciate, our biologists have identificated more than 250 types of orchids, 450 types of birds and also the interandean forest bear, all of them inside Machupicchu Natural Reserve. Another archaeological site will be visited as well: Pacaymayu, Runkuracay, Sayacmarca, Phuyupatamarca, Intipata, Wiñayhuayna, Intipunku and finally Machupicchu which is considered one of the 7 worldwides wonder. Inca trail is regulated by the Peruvian Ministry of Culture and one of the rules states that in order to visit this Archaeological and Natural reserve, a licensed travel agency which operates through the Inca trail is required and mandatorily a professional and certified tourism guide. Note: There are a lot of limitations to make the Inca trail, as only 500 people are allowed per day and this amount includes all the staff and tourists which access every day. For this reason, it is recommended to make your booking at least with 6 months in advance if you are really interested in experience this hike. Hike, guided tours to archaeological sites, camping, adventure, history, culture and more! 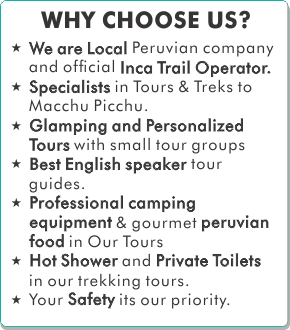 What does Superior Inca trail service include? Chef and cook assistant specialized in gourmet and traditional meals in our region. Drinkable water every day during your trek and snacks from 2nd day. 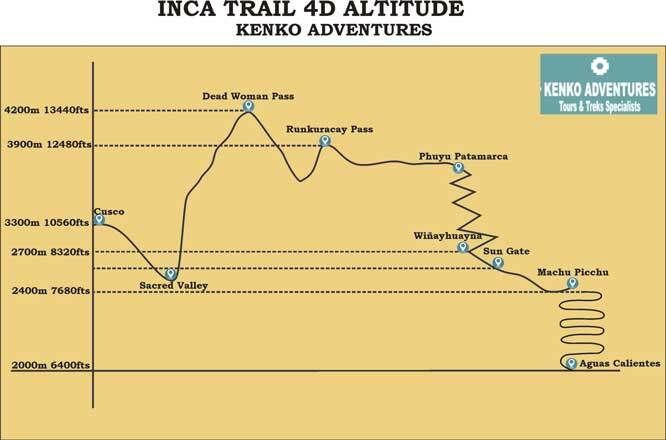 Entrance fee ticket to Inca trail trekking route. Entrance ticket fee to Machupicchu citadel. One way bus tickets from Machupicchu – Aguas Calientes. Transportation from Cusco until starting trekking point. Professional camping and trekking equipment. Hot shower service during your trek. Portable toilet during all trek duration. Heating during all trek duration for cold nights. 01 pair of walking sticks per person, very recommended. Extra porter service to help you with your belongings. During this first portion of the hike, the road is very flat and you can appreciate the archaeological site of Ccanamarka, after 2 hours approx. we will reach the small village called Miskay, from now on the path will be ascending and with another half hour approx. we will reach our first archaeological site: Patallacta, here our expert guide will inform you about the place and then continue for another minutes until reach our lunch place. In the afternoon, our hike will take 1.5 hours at maximum until reach Wayllabamba community, our campsite. Finishing this first hiking day, it will be time to get a nice hot shower (we provide you towels) then time meet our staff members: our chef, cooking assistant and more important, our porters. We will end this first day enjoying some hot beverages and our delicious dinner. Meals: Snacks,breakfast, lunch and dinner. Our day will start with a hot coca tea and a nutritious breakfast to start our hike, but first we will have to fill our bottles/camelbacks with drinkable water that our chef had already arranged along with our snacks. 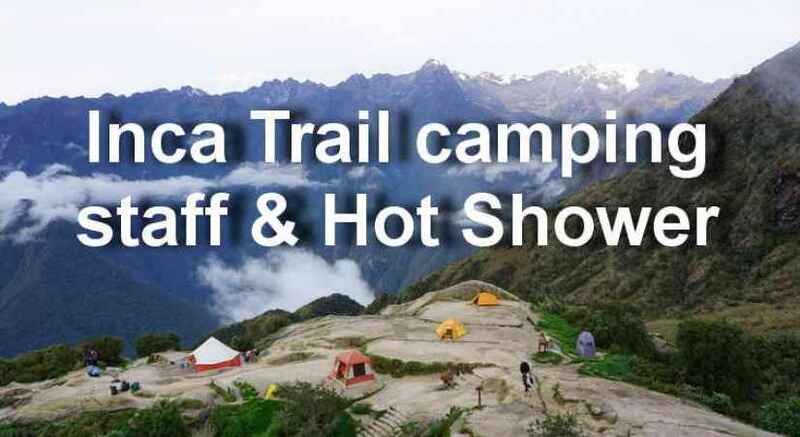 The first portion of the trek will be through the 2000 inca steps which will take us 3 hours approximately, during this hike we will appreciate an exuberant and dense vegetation with native threes of the zone, we will also see some llamas, alpacas, deers and different species of birds and hummingbirds until reach the first break camp called Llulluchapampa in which you can use the restrooms and have some snacks. Then, we will continue for 1.5 hours approx. in a less vegetation area until reach the summit of the Death woman’s Pass (4200 m.a.s.l / 13800 fts.) and from here we will have the panoramic views of the protective Sacred valley mountains as Wayanay snowcapped mountain and to the opposite side Pumacillo snowcapped mountain, as well as the first views of Machupicchu natural reserve. Continuing with the tour description, we will start descending for 1.5 hours approx. through a cobblestoned road towards our campsite, Pacaymayu which is located at 3400 m.a.s.l. On the campsite there are restrooms available and your hot shower will be ready then you will also have a well-deserved leisure time and if you still have energy, you can do some birdwatching. We will finish this challenging day accompanied with some beverages, appetizers and dinner. Meals: Snacks, breakfast, lunch and dinner. We will awake with the beautiful birds singing and a hot coca tea, after we will have our delicious breakfast together with our staff. Then, we will start our uphill hike for 45 mins approx. arriving to Runkuracay archaeological site which is considered an inca checkpoint for more than 500 years! Finishing our visit, we will hike another 45 minutes and reach the highest point of this hiking day, Runkuracay Pass which is 3900 m.a.s.l. and you can appreciate the panoramic view of the mountain forest of Machupicchu national reserve. Continuing our hike descending this portion for another hour and reach Sayacmarka archaeological site, here you will have time to visit and be explained about its location and history by our guide; then you will continue through cobblestoned paths and tropical forest with humidity and abundant orchid species and wildlife, afterwards we will finally reach our lunch place: Phuypatamarca. After our delicious lunch, it will be time to visit one of the most important Inca ritual centers, Phuyupatamarka in which some years ago archaeologists had found inca mommies of children and for this it is believed that it was a sacrifice center. Finishing our tour we will descend for another inca steps for 2.5 hours approx. and finally reach Wiñayhuayna, considered our last campsite and the last archaeological center before reaching Machupicchu. Once there our staff will get ready your hot shower and towels for you then its celebration time. This evening we will celebrate with a sparkling wine bottle as you had accomplished the Inca trail, and it will be time to thank our staff members for all the effort and good service delivered, it will be our official farewell. Climate: Sunny during dry season, a lot of humidity. Cold, windy and cloudy during rainy season. Day 04: Wiñayhuayna – Intipunku – Machupicchu – Aguas Calientes – Ollantaytambo – Cusco. Today our motivation is Machupicchu, so we will start very early in the morning to have the opportunity to see the sunrise and the Sun illumination in Machupicchu. The first hiking portion will be uphill and down for 1 hour approx. until reaching Intipunku and from here we will have an impressive view of Machupicchu Historical Sanctuary and Huayna Picchu mountain. Then, we will descend for another 30 mins more and finally reach the point in which you will have the opportunity to take the famous postal photo of our wonder. Finalizing the photo session, our clients will take a private guided tour including a lot of information inside Machupicchu Sanctuary for 2 hours approx. after this, all of our clients will have leisure time to enjoy more of this amazing wonder or if you had booked in advance your Huayna Picchu mountain or Machupicchu mountain tickets then you can use your free time to accomplish any of these hikes advised by our professional guide. Finishing your visit, our clients will take a bus included in your tour which will lead you to Aguas Calientes town in order to have lunch and some rest to board later your expedition class train departing at 16:22 pm and returning to Ollantaytambo train station. The trip will take 1.45 mins approx. and upon your arrival our transfer will be awaiting for you in our transportation to drive you back to Cusco city and deliver you to your respective hotels. The arrival time in Cusco is 20:30 pm approx. Transportation: Machupicchu – Aguas calientes bus trip bus, train from Aguas Calientes to Ollantaytambo and private minivan from Ollantaytambo back to Cusco. Our price $ 676 USD per person for 2 people. Our price $ 659USD per person for 3 people. Our price $ 649 USD per person for 4 or more people. SECOND, we require a deposit of US $ 300.00 per person in order to purchase your entrance to Machu Picchu and train ticket. You can make you deposit by PAYPAL or you can may a deposit by Interbank. It could be greatly appreciated if our clients pay in cash at your briefing time in the hotel (US dollars or Peruvian soles) here in Cusco. We have many cash machines in the historical center to withdraw money. You can also pay by PAYPAL.